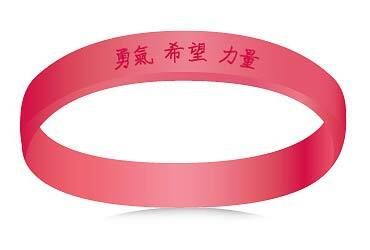 The red wrist band is written in traditional Chinese characters, representing Courage, Hope, and Strength. The Chinese community has the lowest mortality rate for cancer than any other ethnic group. They embody the courage it takes to get screened, the hope for a day when cancer will no longer be a major disease, and the strength to endure a cancer diagnosis. Help us spread the word about the importance of prevention and early detection by proudly wearing the red wrist band. Share the wrist bands with your friends and family to ensure that, like the Chinese community, we all have courage, hope, and strength to lead long and healthy lives. For more information about cancer and the Chinese community, as well as to view the American Cancer Society's prevention and early detection guidelines, please visit www.cancer.org.